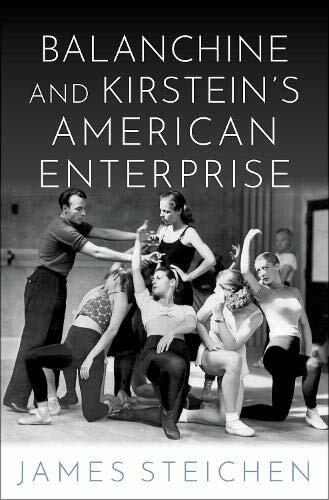 While the history of the creative relationship between choreographer George Balanchine and impresario Lincoln Kirstein has been chronicled before in books on and by both subjects, James Steichen’s book is unique in focusing on the converging and diverging paths of these two giants of the dance world during the 1930s. Kirstein, an independently wealthy patron of the arts, particularly dance, brought Balanchine to America in 1933 to direct a ballet school and company in Hartford, Connecticut. Hartford did not turn out to be the best place for Balanchine and Kirstein’s projects, so the school actually opened in New York City in 1934. Initially, both men agreed that proper ballet training was at the heart of their work; however, Balanchine quickly became more interested in creating dance than in training dancers. With Kirstein’s support, he began the American Ballet (not to be confused with the American Ballet Theatre, which began in 1940), which, after a financially disastrous tour, was for three seasons the ballet company for the Metropolitan Opera. Kirstein founded a smaller company, Ballet Caravan, to give dancers work in the summers and to spotlight dances on American themes. That company produced some major American work, including Eugene Loring’s Billy the Kid, for which Aaron Copland wrote one of his most celebrated scores. Balanchine created a number of important works in the 1930s, including Serenade, written for the students of the School of American Ballet but now a repertory staple of ballet companies, and Apollon Muságete, set to a score by Igor Stravinsky. However, much of Balanchine’s focus in the second half of the decade was on choreography for Broadway and Hollywood including Rodgers and Hart’s On Your Toes, which ended with the “Slaughter on 10th Avenue” ballet, and Babes in Arms. Balanchine was director and choreographer for the 1940 musical, Cabin in the Sky. Some writers on Balanchine assume that this popular work was created out of financial necessity. Steichen argues that Balanchine chose to work in more popular art forms, particularly after his marriage to actress-dancer Vera Zorina. He liked moving back and forth between popular and classical work and loved the luxurious life theater and film offered him. Balanchine was Broadway’s first major choreographer, and his work made dance a much more important aspect of American musical theater. Writing about Balanchine and Kirstein’s artistic collaborations in the 1930s is difficult. Much of Balanchine’s work in this decade was separate from Kirstein’s projects. Their major collaboration on the creation of the New York City Ballet would not happen until 1948. Perforce, the book is most interesting in chronicling Balanchine’s work for the Broadway stage and Hollywood. Steichen offers detailed analysis of Balanchine’s work in the period. One gets little sense from this book of the dynamics of the two men’s professional relationship during this period. Steichen’s structure leads to a fair amount of repetition. He begins each chapter, focusing on a year, with a summary of the contents of the chapter, then presents the same material in more detailed form. The book reads like a somewhat revised dissertation. It is very detailed and the writing style is no more than workmanlike. Nonetheless, for students of American dance history and Balanchine’s career, Steichen’s book offers a comprehensive view of Balanchine’s American work before the creation of the New York City Ballet. Moreover, from this volume, we get a vivid sense of ballet in America before the creation of the two major companies that will begin in the 1940s, the American Ballet Theatre and the New York City Ballet.